For a casually elegant look, wear a Thomas Wylde sheer long sleeve blouse and a black leather a-line skirt — these two items a work setting nicely together. Choose a pair of black leather lace-up flat boots for a more relaxed feel. If you're looking for a casual yet chic outfit, try pairing a Thomas Wylde sheer long sleeve blouse from farfetch.com with a tan suede mini skirt. Both items are totally comfy and will look fabulous paired together. If you're on the lookout for a casual yet chic ensemble, team a Thomas Wylde sheer long sleeve blouse with light blue skinny jeans. Both pieces are totally comfy and will look fabulous together. When it comes to shoes, this outfit is finished off nicely with black leather ankle boots. 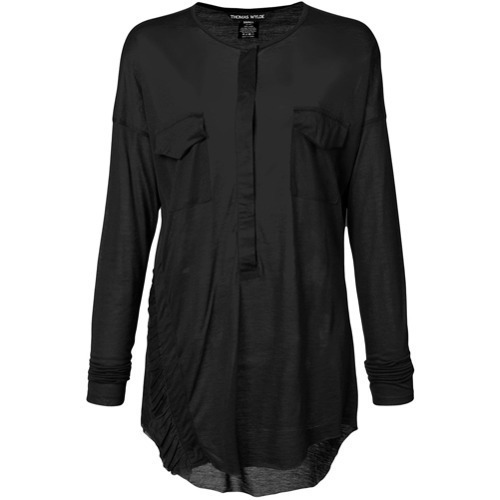 If you're after a casual yet chic ensemble, pair a Thomas Wylde sheer long sleeve blouse with blue ripped skinny jeans. Both pieces are totally comfy and will look fabulous together. Spruce up your ensemble with beige suede ankle boots. If you're scouting for a casual yet chic outfit, marry a Thomas Wylde sheer long sleeve blouse with a silver pleated midi skirt. Both items are totally comfy and will look fabulous together. When it comes to shoes, this getup is finished off well with silver leather pumps. If you're on the lookout for a casual yet totally chic getup, go for a Thomas Wylde sheer long sleeve blouse and a gold pleated midi skirt. Both pieces are totally comfy and will look fabulous paired together. When it comes to shoes, this ensemble is finished off wonderfully with black elastic ankle boots. If you're after a casual yet totally chic ensemble, consider pairing a Thomas Wylde sheer long sleeve blouse from farfetch.com with white skinny jeans. Both pieces are totally comfy and will look fabulous paired together. Black and white low top sneakers will deliver a more relaxed feel to your look. If you don't like being too serious with your combos, opt for a black long sleeve blouse and black skinny jeans. A pair of navy and white horizontal striped espadrilles will be a stylish addition to your getup. If you're hunting for a casual yet stylish ensemble, go for a Thomas Wylde sheer long sleeve blouse and black leather leggings. Both garments are totally comfy and will look fabulous together. To add oomph to your outfit, finish off with black leather ankle boots.